Email to contact@ebiblemission.org with the "Text NOT more than 60 chars"
God has given you a complete authority on your life. But you need a key to enjoy the authority. The code of the key is "God". But Satan hacked the code and added other codes "I", "I am", "I am only" - any thing starts with "I". So your key can open the door based on the code you speak. So let us be in the hands of God, the creator of your life. God loves you so-much. Though you are very happy with your family, the everlasting love of God adds the real taste of Life. You may not be able to explain it but really you can experience it. Don't say "its all because of me", say "its all because my God's Spirit"
The key verse of Bible Mission is: Do whatever God tells you - John 2:5. There is a simple and powerful way of living. As God is available right now, associate with God, listen to Him, obey for His guidance. Prayer: O God! please manifest your presence right now. Please prepare our heart to listen to You. Amen. => Bible: Holy words and Mighty works of God to provide the live evidence to the existence of God. => Mission: the vocation or calling of a religious organization, especially a Christian one, to go out into the world and spread its faith. So the meaning of Bible Mission can be viewed as, "The special work/task given by God to a team to establish the Word (Truth) of God". Its our great honour to work for the Mission of God. For guaranteed result to achieve a vital life (good health, job, excellent experience of life) on this earth and to live forever with God, we need to build our life according to the plan of God. As God created this universe for us and planned our vital life in the beginning itself, the simple step is to avoid the confusion of lots of Do's & Dont's; and follow the easy path as early as possible. Build your life style on below four pillars. Please make your mind to align your life according to the plan of God. 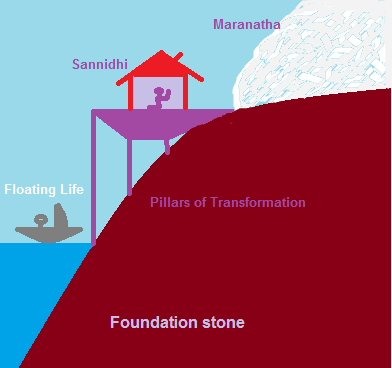 We are going to discuss each pillar in detail on this page. You can share your experience of transformation, we will publish your testimony on this page. Please visit again for more info. Meanwhile, as God is available right now to you, please associate with God and continue building your life with the power of God. May God Bless you. Maranatha!